Buy the DVD F.I.S.H.I.N.G in de Windmill Film webshop. FISHING IN THE DUTCH DELTA. One million Dutchmen play football, two million go angling. F.I.S.H.I.N.G is about fishing and about what moves the fisherman. Is angling a sport, a hobby or is it rather similar to hunting, a primeval and deeply anchored instinct? An Escape to everyday commitments, or heading back to unpredictable nature? And what about the fish itself? How does It feel having a hook stuck inside its mouth? A CINEMATIC QUEST FOR THE FISHING INSTINCT INSIDE MAN F.I.S.H.I.N.G dives into the world of fisherman and fish. Above and below water. Low down town Amsterdam, the coastline, the North Sea, the wetlands, Dutch polders and on and along lakes and rivers. 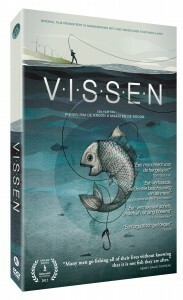 F.I.S.H.I.N.G unveils the parallel world of fisherman and fish in The Netherlands. F.I.S.H.I.N.G is a film by director Pieter-Rim de Kroon and scriptwriter Maarten de Kroon, makers of the award winning documentary Dutch Light. : No English subtitles for the Extra’s. Sorry. Collector and sport angler Peter Paul Blommers discusses noble angling since the Middle Ages and the impressive rise of sport fishing in the 19th and 20th century. More than a hundred years ago Amsterdam alone counted at least 100 Brass-angling associations. In Dutch they were called: baarscolleges. Collector and sport angler Peter Paul Blommers shows us his unique collection and discusses these associations. Author and biologist Tijs Goldschmidt discusses the fascinating similarities that exist between hunting Papuans and men fishing in the Netherlands, the tranquillity anglers seek, nature, the excitement, the competition, full silicon breasted blondes and the need to ‘be off for a while’. The worlds underneath and above the water. In the Papuans’ culture myths and fish have an important role. Tijs Goldschmidt talks about the myth of man and the stingray fish, and the worlds underneath and above the water.